GRAITEC, European software developer for modeling and drawing creation for the construction industry, announces the release of the GRAITEC Advance 2013 suite. Driven by sustainable development challenges, the increasing complexity of projects, time constraints and smaller budgets, construction professionals have no other choice than to make the leap to innovation. GRAITEC, a player in dynamic innovation, dedicates a signifi cant portion of its Research & Development investments in Digital Modeling or BIM (Building Information Modeling), in particular in its GRAITEC Advance suite. This technology associates each real object to its virtual equivalent in the digital model and offers users the ability to simulate the behavior of the real structure, to automate the creation of technical documentation of their projects, to maintain consistency through the changes to the project and facilitate technical collaboration with all project stakeholders. GRAITEC Advance has more than 15,000 users and 7 new users join the community every day. The uniqueness of GRAITEC Advance is to offer a solution that is very effi cient because it is dedicated to building professionals: design, calculation and creation of fabrication drawings, easy training, and provides a rapid return on investment, usually from the fi rst project. The GRAITEC Advance suite consists of software products dedicated to the BIM structure: Advance Design, Advance Concrete and Advance Steel and Advance CAD, a new drawing tool that completes the suite. Version 2013 has many improvements and strengthens its position: simplicity and power. Simplicity because Advance Steel and Advance Concrete work as well as standalone as they do on AutoCAD, the choice is the user’s. In addition to the economic advantage, this innovation allows the release of AutoCAD licenses for other uses within the design office. Simplified installation, getting started faster, optimized interface, in short simplicity. Power because of features such as custom connections in Advance Steel, advanced management of bar marks in Advance Concrete or “Capacity Design” calculation in Advance Design bring greater efficiency to users. For Francis Guillemard, CEO of the GRAITEC Group: “In 2012, the GRAITEC Advance suite saw sustained growth of 35% in a market where the average growth rate was 8%. Independent of the AutoCAD® platform since Version 2012, Advance Steel 2013 improves its ergonomics and ease of use by providing a new user interface element, the “palette”, which contains animated buttons and tooltips. It has many new innovations: first, the ability to create custom connections allowing users to define, store and reuse custom connections in their projects and thus easily adapt to all types of situations. The new release also adds new connections for cold rolled profiles. Many other features are also available such as the option to create welding lines in drawing and a new recognition technology of “notable points” that applies to manual dimensions that are updated automatically by Advance Steel 2013. Advance Concrete 2013 main focus is to offer users the freedom to use Advance Concrete with or without AutoCAD. 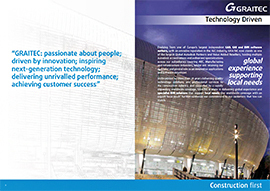 Advance Concrete 2013 includes its own graphics engine allowing the user to select the desired CAD platform. Advance Concrete 2013 provides greater control and better coordination with the “External drawing technology” allowing the user to place each new view and each new layout in a separate DWG. This results in smaller DWG files and better performance. A new bar mark management functionalities is also available. Version 2013 also improves user efficiency and productivity thanks to the new, redesigned Ribbon arrangements and the new Graitec tool palettes. Advance Design 2013 goes further than ever in helping engineers to optimize the design of concrete, steel and timber structures according to the Eurocodes and North American codes. Among the many new functionalities in regards to Eurocodes: major 3D climatic generator improvements for EC1 (more accurate wind parameters definition, better management for isolated roofs, additional fields for CsCd calculation), several improvements on the EC2 engine (possibility to place real reinforcement on linear and planar elements, new slab punching verification, availability of a detailed design report including a reinforcement sketch for concrete beams, etc. ), EC3 engine improvements (accurate lateral torsional buckling calculation considering intermediate restraints and load application point,buckling check for circular hollow sections of class 4, new joints and improved user interface for the steel connection module, etc. ), EC5 improvements (residual area in case of fire verification, improvement of deflection check in the detailed report, etc.). One main new functionality is dealing with the “Capacity design” implementation helping users to optimize members design according to seismical requirements (especially for EC8). Advance CAD is a new comer in the Graitec Advance suite. It is a fully compatible DWG® CAD software. It provides its users a simple, natural and economical solution to the frequent requirements of drawing creation and modification. With a modern easy-to-use interface, Advance CAD creates all 2D entities (lines, polylines, arcs, circles, polygons, etc.) and associates all desired colors, line styles and shading. Concepts such as “layers”, “snap points”, “windows” are available as well as all navigation features (zoom, pan, orbit, etc.). Advance CAD can also create and handle 3D solids (cubes, spheres, cylinders, etc.) and perform Boolean operations. With GRAITEC BIM Connect, Autodesk Revit Architecture 2013 and Autodesk Revit Structure 2013 users quickly connect their Revit models to the GRAITEC Advance suite and then optimize the design of their structures in accordance with U.S. and Eurocode standards, produce effective and error-free general arrangement drawings, fabrication drawings, BOMs, and NC files both for steel and concrete structures. Release 2013 provides key improvements such as extended profile mapping and ACIS solids transfer.